Coloriasto: Photo-Trichromatic Printing. Part III. Three-Colour Work. Historical Sketch. Explanation of the principle of the Process. Action of the selective Colour-Filters. Production of the Red, Yellow, and Blue Blocks. Photo-Trichromatic Printing. Part III. Three-Colour Work. Historical Sketch. Explanation of the principle of the Process. Action of the selective Colour-Filters. Production of the Red, Yellow, and Blue Blocks. 1896The old saying "there is nothing new under the sun" may be apphed to three-colour printing". Attempts to produce coloured prints by superposition of the three primary pigment colours were already made in the seventeenth century by German copperplate printers. This method was greatly improved in the eighteenth century by the addition of a black keyblock. It needed, however, the assistance of photography, combined with a better knowledge of chromatics and spectroscopy, such as the end of the nineteenth century brought about, to enable printers to reproduce objects not only in their natural colours but in perfect contour and perspective with only three printings. J. Clerk-Maxwell first suggested the reproduction of natural colours by the superposition of the three primary colours of light, in a lecture delivered at the Royal Institution on May 17th, 1861. In 1865 Baron Ransonnet, of Vienna, and at the same time Henry Collen, the Queen's drawing master, had the idea of printing coloured pictures in three colours, by taking photographs of the objects by red, blue, and yellow rays and making superposed coloured prints from the resulting negatives. In 1868 two Frenchmen, Charles Cros and Ducos du Hauron published a similar idea of producing three-colour photographs. The first treated the matter theoretically, while the latter made practical experiments. They came nearer the true principle, but did not obtain satisfactory results. They proposed to print in red from a negative on which all the coloured rays except red had acted, in blue from another negative on which all the colours except the blue had acted, and in yellow from the third negative upon which all the coloured rays except yellow had acted. Further efforts were made in 1870 by Professor Husnik, at Prague, and Joseph Albert at Munich, both of which had the assistance and advice of Dr. Vogel, of Berlin, and Dr. Eder, of Vienna. These attempts were more successful although the principle they worked upon was not scientifically correct. Dr. H. W. Vogel, of Berlin, in 1873, discovered that photographic plates could be made sensitive to various colours. However, for various reasons the application of his discovery did not for some time give the expected results. Mr. F. E. Ives, of Philadelphia, in 1881, was the first to produce from three letterpress blocks a photochromic picture, using single line screens similar to what are being used at the present time. Later, Dr. Vogel's son, Dr. E. Vogel, in conjunction with a lithographer, Ullrich, of Berlin, produced photochromic pictures which were exhibited at the German Exhibition in London, in 1891. The system they worked on, however, necessitated the addition of a grey tint, which is not necessary if the process is carried out on strictly scientific principles. During the last few years Messrs. Husnik & Hausler, of Prague, have produced some beautiful blocks for three-colour typographical work; and quite recently the Heliochrome Company, Limited, 122 Elgin Crescent, Notting Hill, London, have made some splendid blocks for three-colour work. Before explaining the principles of photochromic three-colour work it should be mentioned that this process is adaptable not only to letterpress work by means of half-tone blocks, but also for collotype and lithography. Collotype gives the most delicate results, but at the same time is the most difficult to work. For commercial purposes the half-tone blocks reign supreme at present. The principle of photochromic three-colour work is based upon the Young-Helmholtz theory of trichromatic vision. In Part I. it was explained that the colours of all objects can be reduced to three primary colour sensations (red, green, and violet), and with these we can form white light and all possible colours of nature, including tints and saddened colours (or aesthetic shades, as some people like to term them). Three selective colour filters, interposed between the lens of the camera and the sensitive plates will produce three photographs which when viewed simultaneously through the pure colour filters will stimulate the end organs of our eyes in such a way as to reproduce a mental image of the natural colouring of the object. On this principle is based Mr. F. E. Ives' marvellous invention, the Photochromoscope. This instrument will produce a mental image of objects in their natural colours and perspective by viewing the three monochrome photographs simultaneously through pure colour filters, red, green, and violet. To quote Mr. Ives' own words (Journal of Society of Arts, May 27th, 1892): — "By photometric measurement of the density curve of a spectrum negative, the relative amount of action by different spectrum rays may be found. It is therefore only necessary, in order to secure action by different rays in any definite proportion, to use such a combination of sensitive plates and colour screen as will yield a spectrum negative having a density curve corresponding to the graphic curve representing such proportionate action." The proportionate action of different spectrum rays in the respective negatives would be as indicated in the curves in Koenig's diagram if the green of the spectrum was not itself a compound sensation colour. But for this reason it is necessary for this purpose to regard the purest spectrum green as a primary colour, and make the measurement for density curves accordingly. That is what Maxwell did, and Maxwell's curves, although not the true sensation curves, represent the correct proportionate action for the different rays in the photographic process. 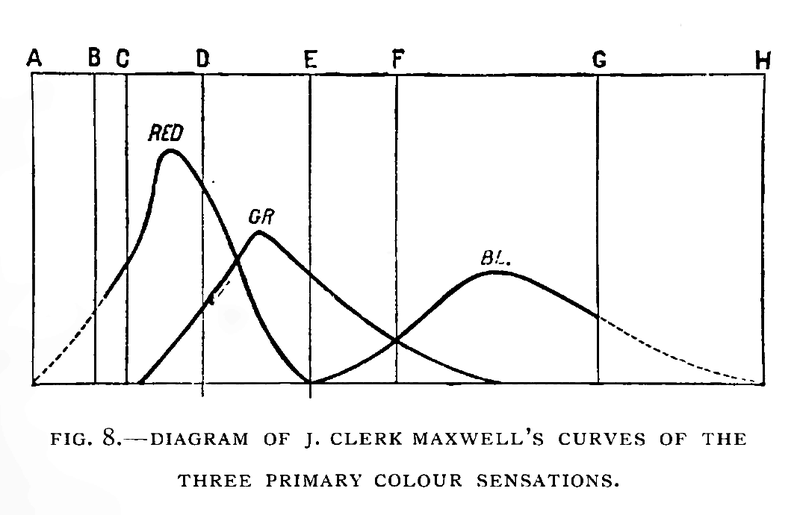 If the sensitive plate was acted upon like the eye, the photographic screens should transmit the various rays in the proportions shown by the form of the respective curves in Maxwell's diagram; but allowance has to be made for the different relative colour sensitiveness of the photographic plates, and for that reason a set of screens that is right for one kind of plate will be all wrong for another. For instance, a yellow screen will give nearly all the action in the spectrum green on an Edwards' Isochromatic plate, and nearly all in the orange-red and yellow on a Lumiere series B plate. It is evident that if one were right, the other must be all wrong. It is obvious that the production of perfect colour filters requires the employment of a photo-spectrograph by an expert. But a close approximation to the best results can be got by using an aurantia screen with a Lumiere series B plate for the negative of the red sensation (printing colour for block, cyan blue), a lighter screen of the same material with a Lumiere series A plate for the green sensation negative (printing colour for block, crimson), and a screen of pale chromium green glass with an ordinary plate for the negative of the blue-violet sensation negative (printing colour for block, yellow). For the purpose of reproduction by colour printing, positives are made from the negatives which record the three-colour sensations, and from these positives, if we use the typographical method of printing, half-tone blocks are made. Each block is then printed in the transparent pigment colour which represents the combination of the two colour sensations stopped out by the colour filter which was interposed when taking the negative. As stated in Part II., all colours can be matched by mixtures of the three primary pigment colours, including greys and black. The three primary pigment colours in which the three colour blocks just mentioned should be printed are therefore perfectly sufficient to reproduce the natural colours of any object as far as this is possible by means of the pigments which modern chemistry has placed at our command. We cannot here enter into the details of making half-tone blocks, neither can directions be given how to make colour filters. Suffice it to say, that some colour filters are made of coloured glass, others consist of glass troughs constructed of two parallel sheets of glass, sealed all round and holding in the intermediate space a coloured liquid. This liquid generally is a solution of an aniline dye of the requisite shade. Amongst the filters now on sale none are correct as far as I know. Experiments are being made at present to produce sets of colour filters of coloured gelatine and also of glass plates covered with collodion films dyed with aniline dyes. So far, however, none of these are on the market. The success of photochromic printing in three colours depends of course in a very great measure on the inks, which like the colour filters permit of no arbitrary selection or groping in the dark. Their colours, as no doubt it will have been inferred from what has been explained, are determined by fixed scientific rules. For that reason I thought it fit to devote a separate chapter to the description of the properties of the inks.